A regular teeth-cleaning routine is essential for good dental health. Follow these tips and you can help keep your children's teeth pearly white and free from cavities.  Fizzy drinks and fruit juice can cause enamel erosion, and sweets can cause tooth decay.  If children do have sweets and fruit juice occasionally as a treat - give them straight after a meal - then wait half an hour before brushing their teeth.  The last thing on your child's teeth before bedtime should be fluoride toothpaste.  Ages 3-6 – use a pea sized amount of toothpaste containing more than 1000ppm fluoride.  Age 7+ - use a pea sized amount of toothpaste containing between 1350-1500ppm fluoride.  Encourage your child to brush their teeth twice a day - morning and evening. The last thing on your child's teeth at bedtime should be flouride toothpaste.  Until your child is at least 7, you can brush their teeth for them - or at least supervise the brushing. It's better for them to have properly brushed teeth than insist on them doing this on their own.  You can start teaching your child to brush their teeth by guiding the brush with your hand and showing them the movements.  Until their 18th birthday, dental appointments should never be more than 12 months apart. Your dentist may advise more regular appointments. Encourage your child to brush their teeth twice a day, morning and evening. The last thing on your child’s teeth at bedtime should be fluoride toothpaste. Don’t brush straight after sugary treats – including drinks such as fizzy drinks or fruit juice. The acid created as a result of eating sugar softens the enamel. Wait half an hour and then brush. Encourage them to spit out excess toothpaste, but not to rinse. Rinsing with water after tooth brushing will wash away the fluoride and make it less effective. Supervise tooth brushing – or do it yourself – until your child is at least seven years old, even older if necessary. Make tooth brushing as fun as possible by using an egg timer to time it for about two minutes – or find a fun app, like BrushDJ. Saliva plays a key role in helping keep teeth protected from decay as it has a pH of 7.1. As saliva production is reduced at night-time it’s important to avoid anything other than water in the hour before bed. Change the brush regularly – especially when the bristles start to curve or look worn out. Don’t let children run around with a toothbrush in their mouth, as they may have an accident and hurt themselves. 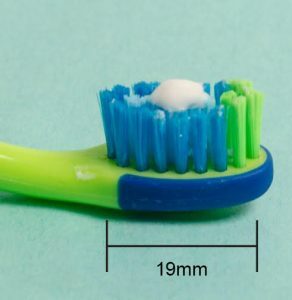 Ages 3 – 6 – use a pea sized amount of toothpaste containing more than 1000ppm fluoride. 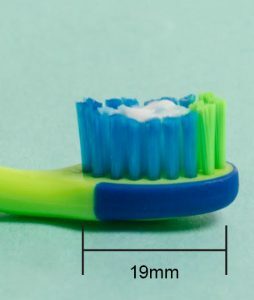 Age 7+ use a pea sized amount of toothpaste containing between 1350-1500ppm fluoride. Make sure children don’t eat or lick toothpaste from the tube. In the UK, you can register for free with an NHS dentist. He or she will recommend appointment intervals. Dental care is free for children up to the age of 18 (or up to 19 if in full-time education). Every child should have fluoride varnish painted on their teeth twice a year from the age of two or 4 times a year if they are at high risk of dental decay. Once permanent molars come through, from the age of about 6 or 7, fissure sealants can be placed on chewing surfaces to help protect them from decay. Sealants should be applied as soon as the molar teeth come through if the child has had decay in their first teeth. If there is decay in a permanent molar, then fissure sealants should be placed on all other permanent molar teeth. My child doesn’t like cleaning his teeth – what can I do? It’s important for your child to be independent, but if they’re not cleaning their teeth properly, you’ll need to step in. You can teach them independence with other activities. If your child is resistant to you cleaning his teeth you could negotiate a situation where they are allowed to do the first clean (or the last clean) and you get to clean as well for around 2 minutes. Be really gentle as it can be very uncomfortable having someone else clean your teeth. You can use toothbrushes that light up for 2 minutes, or a fun app like BrushDJ (which is recommended by the NHS and free) or an egg timer to help your child to see how long to clean his teeth. These help motivate and distract the reluctant tooth-brusher. If you would like to see more information from the British Society of Public Health England, please click here.